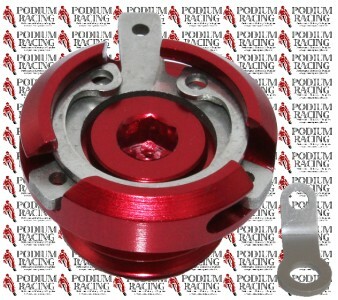 You are looking at a new RED race style Engine Oil Filler Cap, with new O-Ring, and will fit most Ducati models. You will receive the filler cap and the removable bracket that attaches with one of the engine case bolts and makes the safety wiring easy and secure. This model has thread M22 x 1.5mm and fits all models in the table below. 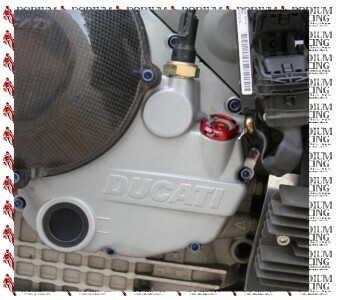 This is a very stylish and functional oil filler cap which allows you to safety wire the filler plug to the bike so that it never comes lose while riding. The double locking mechanism allows easy removal without having to rewire each time. 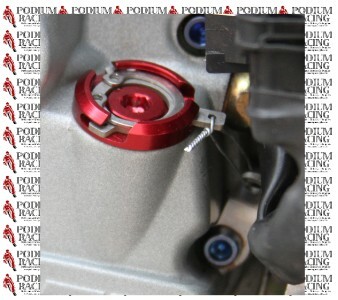 After first assembly simply remove the spring clip and unlock the bracket. These oil filler caps are light CNC machined from billet 6061-T6 aluminum with a hard anodized finish. Please see our other auctions for our M20x2.5mm style for all other models not listed above. While changing the oil filler cap, why not change your engine case bolts to cool looking and light weight Titanium? We show blue titanium engine case bolts in the listing picture. Don’t forget to visit our ebay store for other great Podium Racing titanium nuts, bolts, shop tools, custom bike covers, levers, rearsets and more.